The following is a guest post by Tim Pietrusky. I know Tim from his prolific work on CodePen and from being a helpful community member there. He wrote to me with this guest post about responsive menus which I'm more than happy to share with you below. Not only is it a timely concept, but one of the concepts improves upon a clever CSS trick we've covered here in the past. All menu concepts in this article are based on this simple HTML structure which I call basic menu. The role attribute is used to specify the particular concept (full-horizontal, select, custom-dropdown and off-canvas). To address small screens I use the same media query on all concepts. This is the most simple approach because you just need to make the list elements full width on small screens. This is what it looks like on a small screen with a custom style. This concept hides the basic menu on small screens and shows a select menu instead. We hide the select on big screens. On small screens, we hide the basic menu and show the select. To help the user recognize that this is a menu we’re also adding a pseudo-element with the text “Menu”. This concept hides the basic menu on small screens and shows an input & label (to use the Checkbox Hack) instead. When the user clicks on the label, the basic menu is shown underneath. Doesn’t work on mobile Safari (iOS < 6.0). It’s not possible to click the label on iOS < 6.0 to toggle the input due to a bug. The only solution is to add an empty onclick to the label. Doesn’t work on the default Android browser (Android <= 4.1.2). Once upon a time there was a WebKit Adjacent/General Sibling & Pseudo Class Bug which prevented the use of pseudo-classes combined with adjacent (+) or general (~) sibling combinators. This has no effect because the checkbox hack uses the pseudo-class :checked combined with the general sibling. And since this was fixed in WebKit 535.1 (Chrome 13) and the actual WebKit on Android 4.1.2 is 534.30, the normal checkbox hack doesn’t work on any Android device to date. The best solution is to add a WebKit-only fake animation on the body element. For small screens, we hide the basic menu and show the label. To help the user recognize that this is a menu we’re also adding a pseudo-element with the text “≡” (converted to “\2261” to use it as content on the pseudo-element) to the label. When the user clicks on the input, the basic menu gets shown and the list elements are expanded to full width. This is what the menu looks like on a small screen with a custom style. This concept hides the basic menu on small screens and shows a HTML input & label (to use the Advanced Checkbox Hack, see 3. 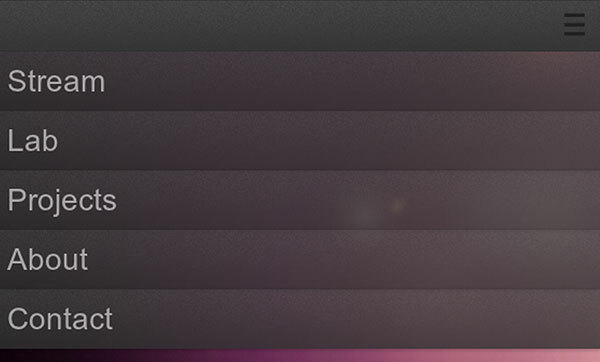 Custom Dropdown for more infos) instead. 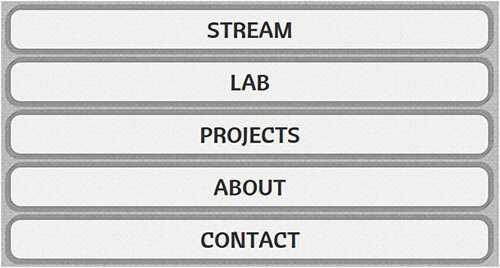 When the user clicks on the label, the basic menu flies in from the left and the content moves to the right – the screen gets divided: menu ~80 % and content ~20 % (depends on resolution and css units). On large screens, we hide the label. On small screens, we hide the basic menu outside the viewport and show the label / input. To hide the menu we specify a width ($menu_width) and add a negative position to it. To help the user recognize that this is a menu we’re also adding a pseudo-element with the text “≡” (converted to “\2261” to use it as content on the pseudo-element) to the label. When the user clicks on the input, the basic menu flies in from the left and the content moves to the right. Does it Work on IE? All of the techniques used above have one goal: Create responsive menus for modern browsers! And because there is no IE 8 or lower on any mobile device we don’t need to worry about it. :target is ideal for semantics, but a bummer in that it adds history items (affects back button). :checked is less good semantically but functionally is better. This would be a case where I would tend to ditch the semantics. We’re probably the only ones that are going to see and actually care about semantics, and the non-semantic version works better. So, I’d tend to just use what works. The average user of the site probably won’t see the code, and, if they do, they probably won’t care about semantics. True, but more accessibility-oriented user agents (screen readers, etc.) rely on semantics to find the elements of the site that the user wants displayed / read. @Ando, True, but I would tend to think that screen readers, etc will tend to see the <nav> instead of :checked or :target. You’ve certinaly brought up a good point, though. Yeah, to be honest, I’m not entirely sure how screen readers would function with regards to inputs and lables within a nav tag. It could go either way as far as I know, haha. Awesome article Tim! Very clear and providing many ways to do one thing, I like it. By the way, this checkbox hack addition is completely sick, I wonder how you could even think of something like that! Some good old trial and error for many hours on various platforms with the help of BrowserStack. I just wanted it to work everywhere. I think that use of attribute role isn’t a good idea, you can use data-* attributes instead of it. I will think about the use of data- instead of role-attributes! Thank you. I would strongly agree; it’s the very first thing that caught my eye. role should define (in a machine-readable way) the purpose of an element, but here, you’re using it to define how the element is presented. As @Israel suggests, using data-* attributes (or even a class) would be more appropriate. Great roundup! I’ll probably come here 1000 times in the future. It seems these stylings groups could be based off a simple HTML class rather than the role attribute. The role attribute is typically, although not exclusively, reserved for ARIA roles, which are confusing already but are a set of pre-defined roles that have meaning to other machines. I didn’t know that the role attribute is reserved for ARIA roles. Thanks for the info! Not technically reserved per say but it serves its purpose for ARIA / screen readers etc. What you did technically wasn’t wrong as you just selected by attribute, but I’m sure others will advise you to the “data-” HTML5 attribute approach as its designed specifically to handle things the way you’re looking to. What you need to be careful with when it comes to HTML5 custom data attributes is that plugins/libraries code may leverage the same naming conventions you will without you realizing it. A Standard enough naming convetion like img src=”” data-index=”0″ alt=”Bobs Hair” could possibly be used in conflict throughout your application, so just be mindful of your naming conventions. Some great solutions there, given me lots of ideas and things I want to try. When I do the checkbox hack, to get over the iOS bug I just style the <input> instead with (-prefix-)appearance: none; at the beginning to override default styling. The iOS bug is not about styling. It prevents you from clicking on the label to toggle the input (checked / not checked). And if you want to fix the bug, you could add an empty onclick onto the label or place the input (with full height/width) in front of the label. The point that I was making is that you don’t even need a label if you style the input. I know it’s not about styling. You can still have the icon with a ::before and maybe even have a hidden label for SEO, but it removes the need to have that empty onclick. Now I get what you mean. That sounds like a really cool improvement to get rid of the label. But unfortunately it’s not supported in the latest Opera or Internet Explorer 10. That’s true, although I think that by adding a border, the default appearance is overridden anyway (I know it is with text inputs). @Martin: I’ve done a very similar thing, and is my favourite approach. But the last on the post (Off canvas) is pretty good, guess I’ll do a combination, generally I steer clear of form elements for navigation. Very nice guys, thank you. Anyway, i don’t think labels and inputs or options are semantically right for navigation. I think the best right now is the first option, full horizontal. Yes, it can take up a lot of screen space if you have many top-level nav items, but its the only one that has no other downsides. Perhaps in the future we’ll have better semantically-correct options, until then I feel this method is the safest. As Dave wrote above, this article is a good reminder to keep in mind when creating a new responsive menu. Is it possible to add sub menus? Chris, It would be interesting to be able to resize the codepen iframes, so we can see the media queries in action without needing to open in another tab, and them, resize the browser. Is there a way for that scss to be converted in just normal css. Hey there, If you click where it says SCSS in codepen it will compile into CSS. Hi – very well written post! So right from the top, this post seems to do for desktop first, with mobile mods to make the small screens behave nice. The examples don’t work on my iPhone; I just get the “full size” page. Is this a limitation of codepen? It doesn’t let you set the viewport meta tag? For me the best solution is still a combination between 1 and 3, or you could even do 1 and 4. Meaning that you have a menu that is visible at the top (or bottom) of the page by default and turn that into one of the other solutions when the page loads with JS. Then you can use JS events for triggers and aren’t reliant on the checkbox hack, which seems like just that… a hack. Thanks for the post! Great write-up Tim! And thanks again for your help with the navigation menu plugins I’ve been working on. Perfect categorization and comparison , just as always! As @Vivek Nath.R mentioned above, none of the examples address sub-navigation. While I would always love to build websites without any sub-nav, it’s just not possible with certain clients (or websites). A big challenge with responsive navigation seems to be how to handle large menus. Brad Frost has some great examples here. But great post, it’s nice to see CodePen being used so well. It probably would have been good to include the word ‘mobile’ in the title of the post. PD. Where is the share link? How would you go about making a menu which uses hover for dropdown on PCs, and clicks on Mobile?